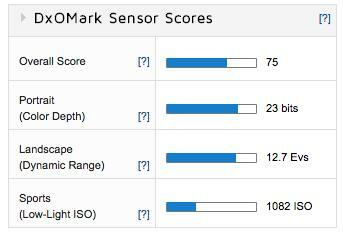 With an overall DxOMark Sensor Score of 75, the Leica T ranks 71st on the DxOMark database for all camera sensors and 32nd for all cameras featuring an APS-C-sized sensor. 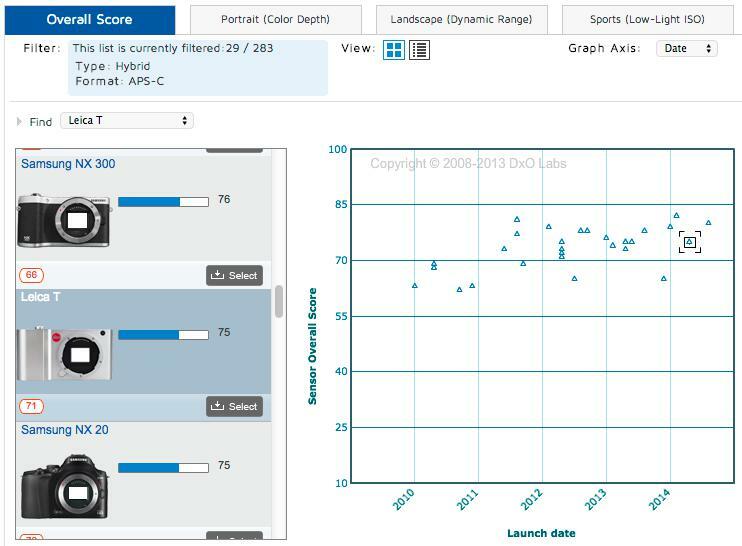 Closer analysis of the three sub-scores indicates that Dynamic Range and ISO are slightly stronger aspects of sensor performance. A Dynamic Range score of 12.7 EVs and Low Light ISO score of 1082 come in at 63rd and 57th place, respectively, whereas a slightly weaker result of 23 bits for Color Depth impacts the Leica T’s overall performance. 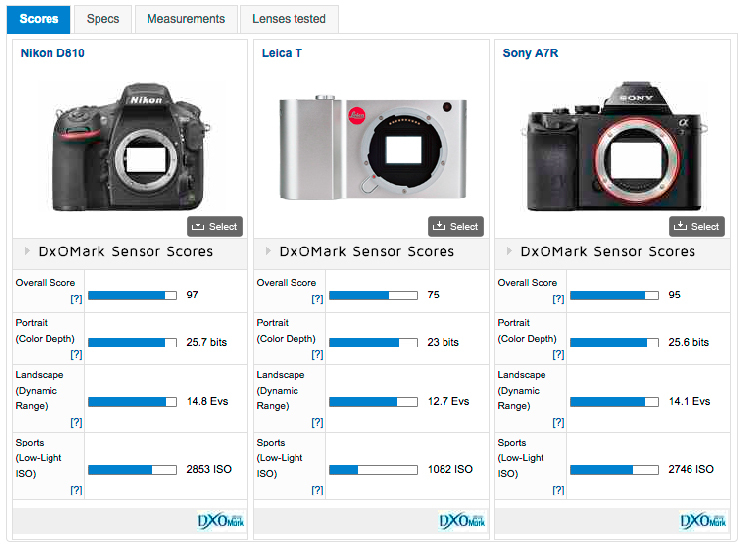 Comparing the Leica T’s scores to the best-performing chips on our database, we can see that the full-frame Nikon D810 and Sony a7R, with overall scores of 97 and 95 respectively, offer 1.5 stops of better image quality. With Portrait scores of 25.7 and 25.6 bits, both offer 2 stops of better Color than the Leica T and around 1.5 stops of improved ISO performance, too. Obviously this is not a totally fair comparison, pitting the full-frame chips of the D810 and a7R against the smaller APS-C sensor in the Leica T, but it helps to put the scores into some context, considering the Leica T’s hefty price tag. 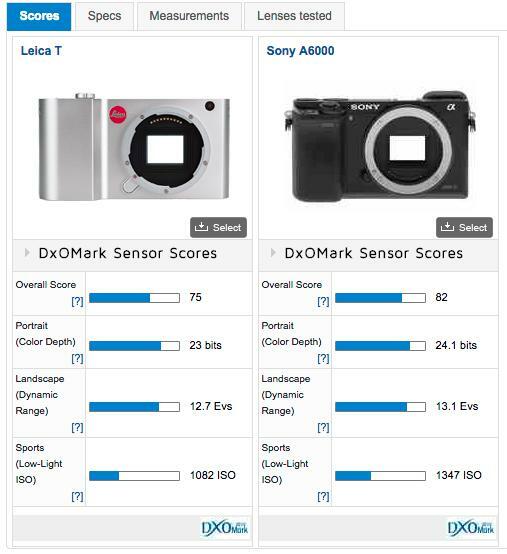 Against the best-performing APS-C sensor on our database, in the Sony A6000 hybrid camera, the Leica T fares a little better. With an overall score of 82, the Sony A6000 offers around 2/3rd of a stop better for Color as well as 1/3rd of a stop for improved Dynamic Range and ISO in a significantly cheaper body. At $698 (body only), the A6000 costs less than half of the Leica T, with even greater savings when you consider the cost of lenses for the Leica T. This all said, the Sony A6000 doesn’t offer the same level of build quality or refinement. Factor in the cost of a lens for the Leica T, and together with the $1950 Leica Summicron-T23mm f/2 ASPH lens (equivalent to 35mm), the total package costs around $3,800. 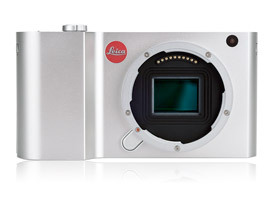 If it’s a small and portable top-end camera you’re after that’s around $1,000 more expensive than the $2,798 Sony RX1 high-end compact or the $2,896 Sony a7R (including the FE 35mm f/2.8 ZA lens), then the Leica is for you. 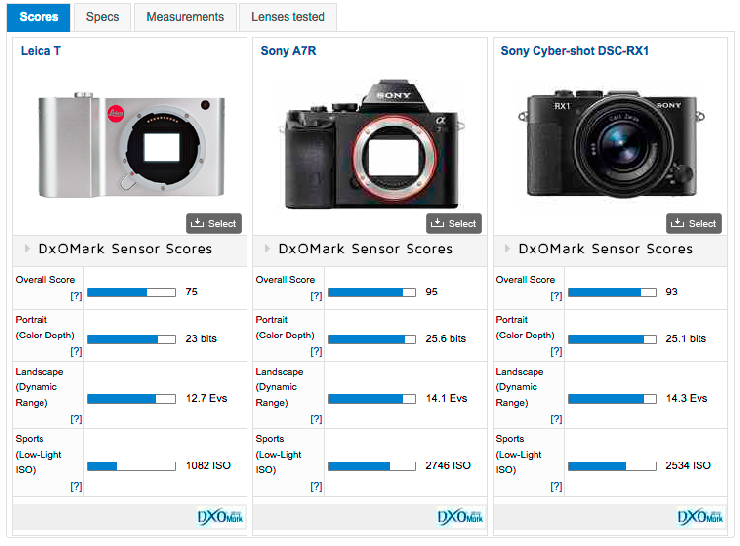 Again both Sony cameras are full-frame options, compared to the Leica T’s APS-C sensor, but are two of the best-performing sensors in our database, offering better sensor performance for much less money. Of course that all slightly misses the point of owning a Leica camera: with its refined build quality and exceptional lenses, it’s an object of desire for many photographers with deep enough pockets.